Taormina, founded in 358 a. C. on Mount Taurus, enjoys a unique view stretching from the Etna to Catania beach, attracting a million tourists every year thanks to its natural beauty. 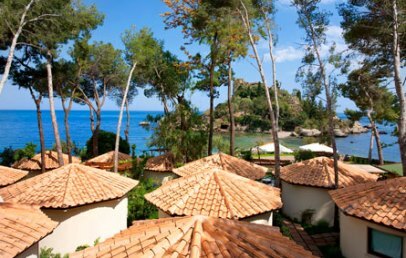 La Plage Resort is located in the most charming pebble beach of Taormina, in front of the beautiful Isola Bella, today natural heritage site, separated from the mainland by just a narrow sand strip. 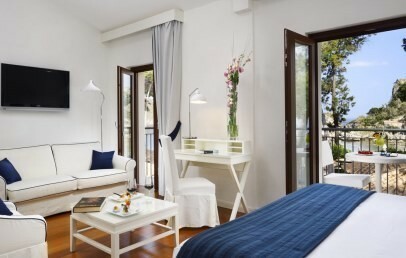 La Plage Resort completely renovated embracing a new hospitality concept based on "Define your Lifestyle" is set in an ancient pine forest, with pine trees and fragrant gardens, with typical Mediterranean vegetation. The best place for nature lovers, who can immerse in the beautiful marine park of Isola Bella waters, which has become the natural habitat for several organisms: some kinds of algae, colourful fishes, shellfish and many others. Contemporary and minimalist decor are in every room and in all common areas, taking care to every detail. An elegant Asian atmosphere characterizes the entire structure. Several solutions are available for the guests of La Plage Resort, with its 59 accommodation units, which include 46 bungalows. Bungalow garden view or sea side or sea side with outdoor whirlpool – (approx. 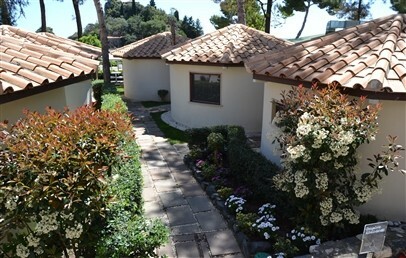 21 sqm) comfortable and cosy villas, all with small private garden with garden or sea side. Deluxe Bungalow sea side with outdoor whirlpool – (approx. 21 sqm) comfortable and cosy villas, all with small private garden, wading pool and sea side. 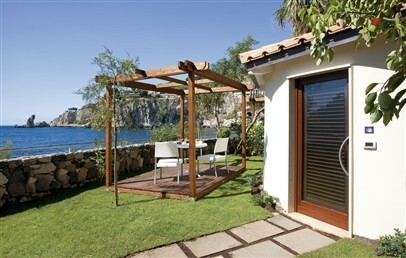 Superior garden view and Deluxe sea view – (about 27/28 sqm) intimate and bright, with a relaxing garden or sea view. Suite sea view and Suite sea view with outdoor whirlpool – (approx. 60 sqm) spacious and comfortable, featuring an accurate design: all the suites are elegantly furnished and comfortably equipped with contemporary decors. 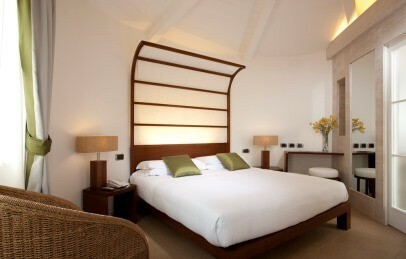 Deluxe Suite – (approx. 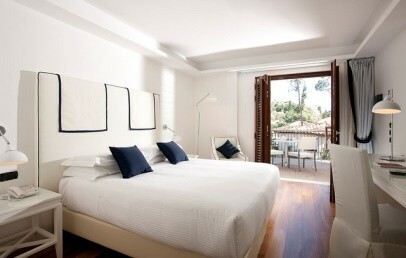 86 sqm) has a spacious bedroom and bright living room, a privileged position offering a top view on the Isola Bella. They are all equipped with private terrace and outdoors whirlpool. The room rate includes: private parking for cars/scooters, beach service (2 sunbeds and 1 umbrella per room), free Wi-Fi throughout the hotel, access to the fitness area (no SPA). For those who want to spend some time at the beach, the Luxury Beach Club is available: the beautiful unique pebble beach, stretching out on the beautiful natural bay in front of Isola Bella, disposes of 200 beds, 100 beach umbrellas and a bar kiosk. A modern fitness room and Spa, with its 68 square meters of internal surface, offers one box for beauty treatments, two boxes for water massages, a box massage and an indoor fitness area (open from April until October). La Plage Resort offers a wide range of sporting activities in the nearby sports centres. The reception will explain the options, ranging from golf, tennis, diving, to paragliding. The cuisine of the Restaurant “Fusion” concentrates in the taste and in the elegance of the presentation; its harmony introduces the concept of "balance of Zen flavours", that is the soft perception of their tastes on the palate that leads to completeness. The restaurant “Fusion” comes from the skilful mixture of regional tastes with oriental methods, getting an alternative cooking but keeping the passion and dedication for this art. Guests can also relax at the Fusion Bar (only open from April to May, located inside the Fusion Restaurant) or at the Beach Bar, only open from June to October and located right on the beach, to enjoy ice creams, fruit drinks and refreshing cocktails. Private parking and mini club are available on request. Additional services : laundry service, excursions and guided tours, luggage room. Wi-Fi connection is free of charge throughout the resort/hotel. Tourist tax – The municipality of Taormina requires the payment of a tourist tax of € 5,00 per person/overnight (excluding children under 12 years), for a maximum of 10 consecutive overnights and has to be paid on spot at the check-out. Nice double room in the area overlooking the bungalows. They are rooms furnished in fine Asian style with a special care for details present in whole hotel building. The private bathroom has a shower, a tub, bathrobes and hairdryer. Superior Rooms have a small terrace with garden view. Wide Suites Suite consisting of two luxurious bedrooms and a separate living room furnished with elegance and modernity with table and sofa. They have three bathrooms with tub, shower, bathrobes and hairdryers. All the Suites have a large private patio with Jacuzzi and a panoramic sea view. Cozy and comfortable bungalow in the inspiring and shady ancient pinewood. They are all furnished in fine Asian style with a special care for details present in whole hotel building. The private bathroom, wide and luxurious, has a tub, shower, bathrobes and hairdryer. From the bright and large windows guests can enjoy a relaxing view over the tree and the flowers. Wide bungalow in a relaxing and private part of the Resort. They are all furnished in fine Asian style with a special care for details present in whole hotel building. The private bathroom, wide and luxurious, has shower, bathrobes and hairdryer. The Deluxe Bungalows face the sea side and have a private equipped garden plus an outdoor Jacuzzi. Cozy and comfortable bungalow in the inspiring and shady ancient pinewood. They are all furnished in fine Asian style with a special care for details present in whole hotel building. The private bathroom, wide and luxurious, has a tub, shower, bathrobes and hairdryer. The Bungalows have bright and large windows on the sea side. Cozy and comfortable bungalow in the inspiring and shady ancient pinewood. They are all furnished in fine Asian style with a special care for details present in whole hotel building. The private bathroom, wide and luxurious, has a tub, shower, bathrobes and hairdryer. In the sea side front part guests can enjoy a beautiful Jacuzzi. Intimate and elegant Suites consisting of two bedrooms divided by a hallway and each of which opens onto a pretty balcony with sea view and equipped terrace. Every room has its private bathroom with tub, shower, bathrobes and hairdryer. Exclusive Suites with a bright and luxurious double bedroom with sea view plus a fine, modern and furnished living room with couch and coffee table. They all have 2 bathrooms with tube, shower, bathrobes and hairdryer. They also have a private patio with sun beds and Jacuzzi.